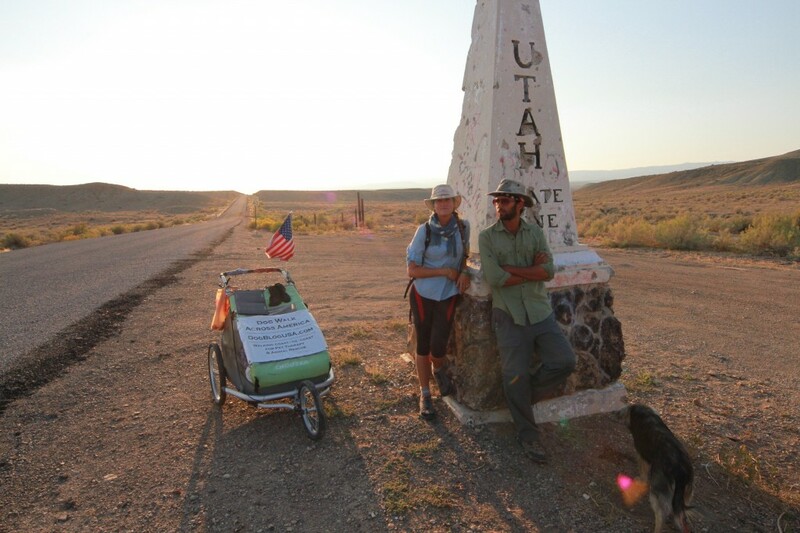 We are three days into the Utah desert. 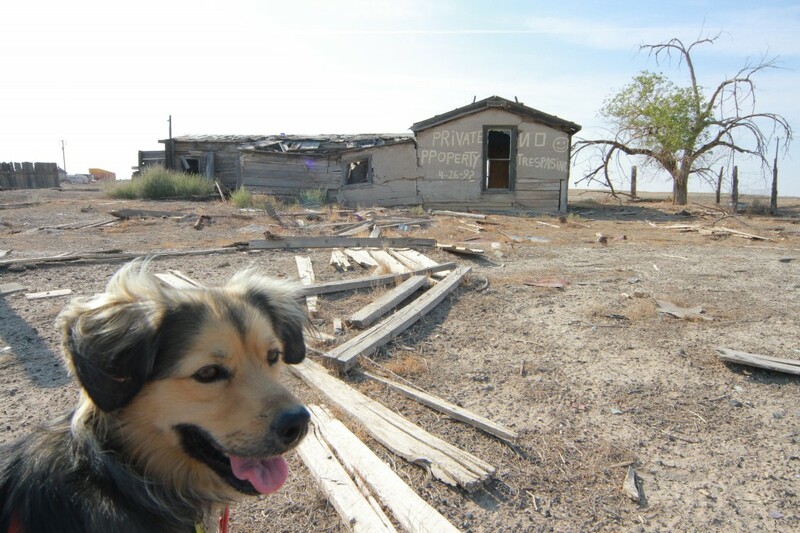 Our route thus far has paralleled I-70, through the most barren and empty expanses we have seen yet. Far off in all directions, mountains and canyon walls loom beyond the empty vastness of dried grass and red stone sand. Other than some roaming antelope, a few snakes, and a massive contingent of hardworking ants and wasps, there is nothing out here. When we walk away from the road to camp, it is so quiet that my ears fill with the subtle ringing of frequencies that I can no longer hear, thanks to years of standing next to massive speakers. I wonder how solo hikers managed to cross this expanse – and at the same time, I yearn for their loneliness out here. Part of me wishes I could be alone with my thoughts, with nothing but space to keep me company. 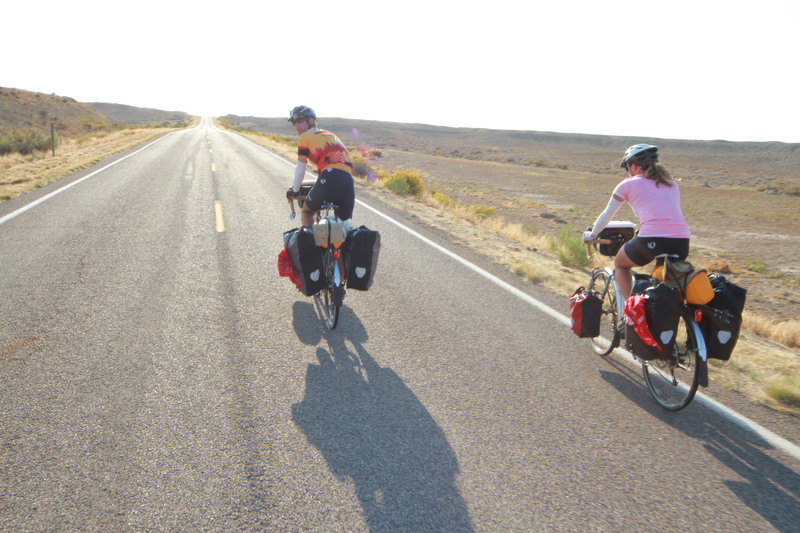 this couple is biking from Calgary up in Canada, all the way to the Mexican border. Our group has grown from just Kait and I and our two dogs, to now include Jon Slater, Old Brown dog, Jenny the cornfield stray, and now Rob, the Germanator. That’s eight bodies, all needing water and food and water to survive. Even with a support car, we are struggling to carry what we need to sustain our team of eight across the desert stretches of 50-100 miles between services. Back in West Virginia, Glen of the Fellowship told us that it never matters how big or small someone’s car is – it is the size of their heart that matters. If they want to pick you up and help you, they will find a way to fit you and all of your stuff in the car. When we picked up Jenny in Iowa, we found space in a full car. Then in Glenwood Springs, we found room for Rob and his backpack. Now, we need to find room for the food and water. I have been hearing tales of Moab for longer than I can remember. 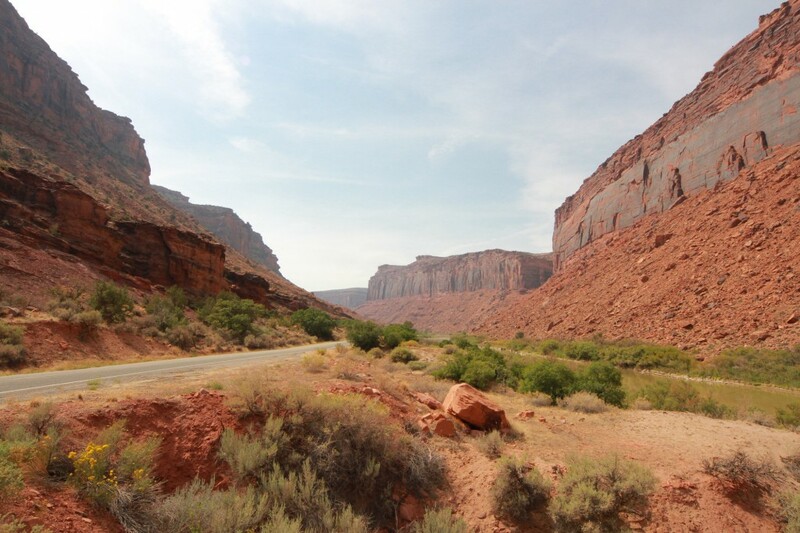 Every rock-climbing Jeep Wrangler owner knows – or at least pretends to know – of this magical wonderland called Moab. 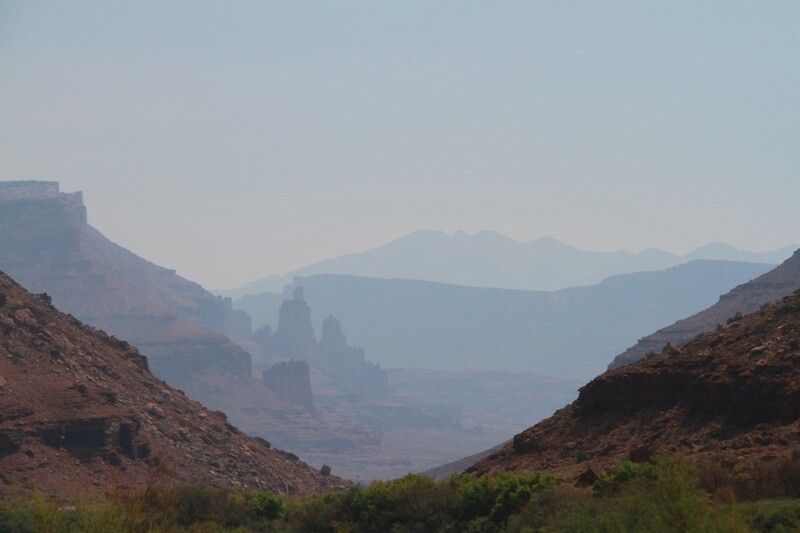 Our route takes us north of Moab, toward Green River, but yesterday we decided to take a detour. The drive down along the Colorado River was breathtaking. I have never seen such a beautiful place in all of my life. 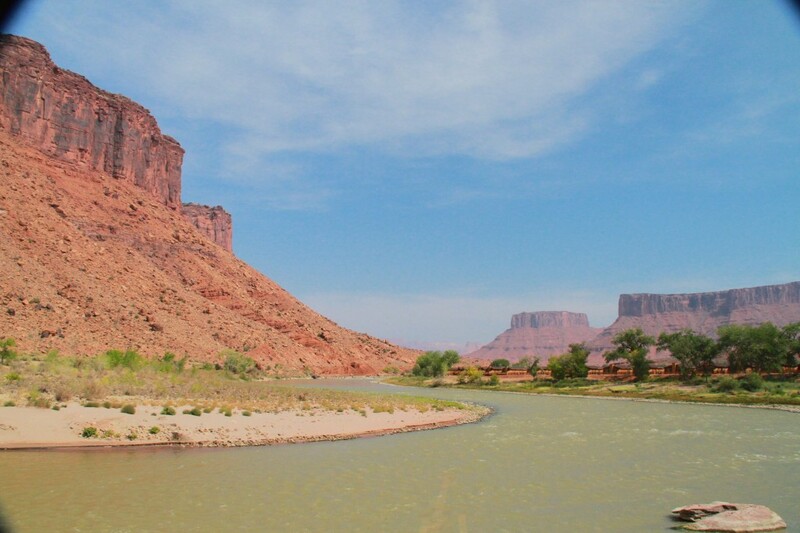 We marveled at the towering faces of red rock, and took a dip in the mighty Colorado. The town of Moab is very tourist-oriented. The main drag is packed with nice restaurants, innumerable motels and hotels and RV campgrounds. Every building seems to have a sign advertising rafting adventures, guided hikes, and ATV canyon tours. Nestled in the canyon, this place has a powerful energy. Someone told me that the surrounding lands are some of the most photographed locations in the world, and I don’t doubt it. I would love to spend a year here, filming the play of light and color as the monoliths and castle peaks continue their slow and steady disintegration. 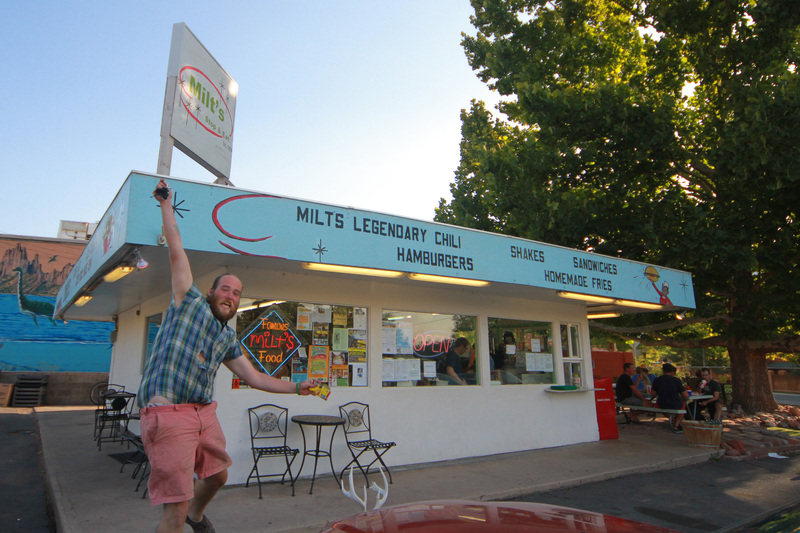 A Moab native gave us a tip and sent us to eat at Milt's, off the main tourist drag. Don't miss Milt's if you're ever in Moab! We found ourselves at the Lazy Lizard Hostel, surrounded by fascinating folk – some who live here, and some who are just passing through. We showered and did laundry. We like those things. On into town, we hit Gearheads outfitters for some odds and ends and planned an all-out assault on the local grocery stores. Today, we democratically decided to take a mental health day. No visits, no errands, no walking. Life on the road is very stressful, and with eight independent minds living in close proximity in the great vast empty, a break and some free time is critical to keeping crimes of passion at a minimum. We may not make any miles today, but as long as the young dogs don’t wake Grace from her nap, nobody is going to eat anybody else. 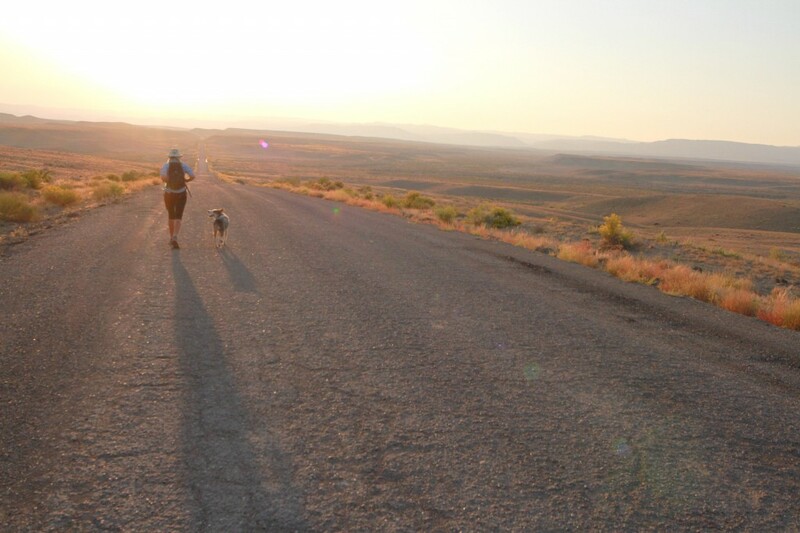 This entry was posted in Trail Life and tagged across, america, animal rescue, desert, dog, gearheads, hostel, lazy lizard, milt's, moab, pet therapy, rescue dog, therapy dog, Utah, walk. Bookmark the permalink.